Ancient Egyptian bloggers on the walls of Sakkara tomb. "Visit the Step Pyramids of Zoser at Sakkara and the Memphis Museum. 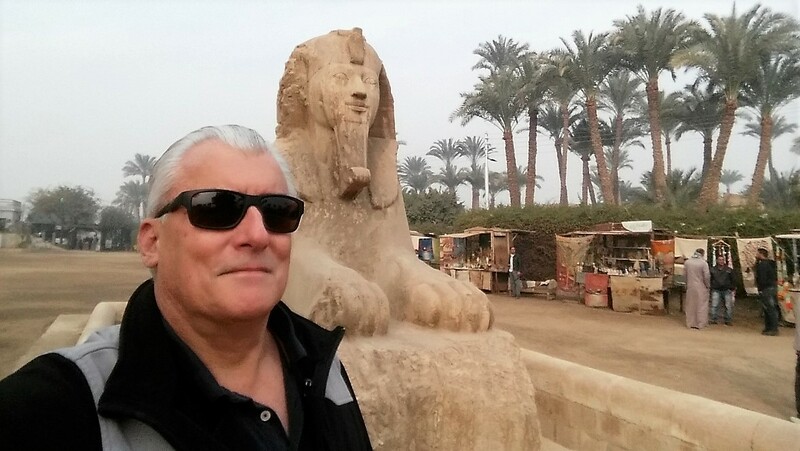 After the tour, I hope you accept our invitation for Lunch at our house, the car will bring you to our house after the tour and return you again to the hotel"
Our first stop was the open air museum of antiquities in Memphis, Egypt. Adham was careful to set expectations that this was a far smaller and less impressive venue than the the Museum of Antiquities in Cairo. But then, pretty much everything is. Historically important, Memphis dates to the 1st Dynasty, was the first capital of Egypt and is a United Nations World Heritage Site. The site and city is archaeologically rich in artifacts and ruins throughout Old, Middle, and New Kingdoms of dynastic Egypt. Ramses II figures prominently in it's history. The centerpiece of the museum is largest statue found of Ramses II. Our next stop was the vast burial grounds of Saqqara, again dating from the First Kingdom. Covering over four square miles, the site contains the ruins of the first pyramids and and the burial grounds of the first Egyptian kings. If the visitor is willing to stoop and duck walk their way through the access portals, the site offers an intimate level of accessibility to the interior of the ancient tombs and the extraordinary interior wall art found there. Probably too much. Millennia old painted reliefs are tempting to touch, and the visitor controls are not there to stop it. Today and in time past, the district was known for the quality of it's craftsman. After leaving the burial grounds, we stop at a carpet school (and showroom) and see papyrus demonstrated and displayed (in a showroom). 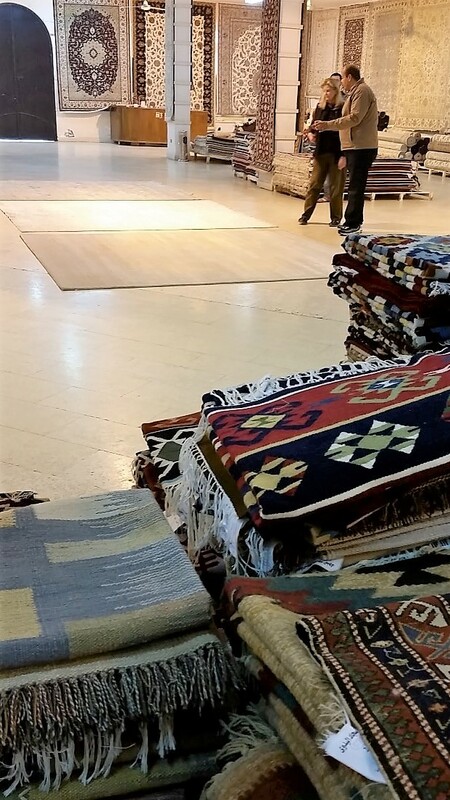 Paper and hand woven carpets are two gifts that ancient Egyptians left to the modern world. ... so I was very happy to escape the afternoon with a few items from Golden Eagle Papyrus. This included a custom assembled papyrus journal. Custom journals is a bit of theme for me on our foreign ventures. Sayed (below left) owns and manages Oriental Egyptian Tours and caters to small groups and custom itineraries. Sigrid worked with him for months putting our trip together. 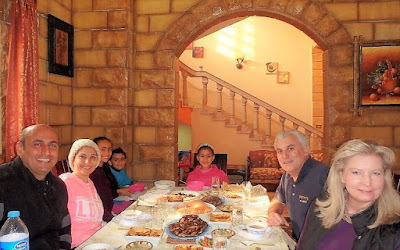 He invited us to his home for lunch with his wife Noha and three delightful daughters. It wasn't a lunch. It was an Egyptian feast. Everything was great. It was a special invitation with wonderful food and company. Definitely a highlight of our trip. And the day was not over yet. This was our last night at the Cairo Marriott Omar Khayyan. We could not leave without another visit to our new favorite bartender, Amir Nabil Fouad in the Billiard Room Bar. Our stay at the Marriott was thoroughly enjoyable. Great service throughout. We saw visitors from all all over the globe, but this seems to be the hotel of choice for Americans traveling on business.